The Merrell Pivot Lace shoes provide performance on the trail, yet are comfortable and good-looking enough for casual wear. Merrell Pivot Lace trail shoes provide, perhaps, all of the qualities you’ll require while loping across uneven terrain. Choosing a trail shoe is fairly subjective to the individual, so what worked well for a tall, 220-pound, guy may not be so impressive to a lighter, leaner, person. But what you can glean from this review is that if the Merrell Pivot Lace shoe is comfortable with more than 200 pounds crashing down with every step, they are quite possibly going to be extremely comfortable, and stable, for a lighter person. Walking or running on rocky, muddy, or loose soil is rife with opportunities to “catch an edge” and twist your false sense of security right out of an ankle. What we found with the Pivot Lace is a very stable platform with a good balance of flexibility from the ball of the foot out to the toes, and rigidity of the outsole and mid-sole from the heel to mid-foot. Vibram outsoles offer good grip, but have enough void-space between lugs so debris don’t get caught. Mt. Khakis Lake Lodge Twill pants were also tested on this hike. With the outsole wrapping up around the entire foot, additional stability is generated because the actual footprint is several millimeters wider than the foot itself. This is something you may not readily notice, but, like a high-performance automotive tire, the wider the contact patch, the greater the stability for that surface. And even though these shoes are considered a low-top, the way the shoe “cradles” the ankle provides lots of ankle support as well, which enhances foot stability. Not only does the Pivot Lace shoes cradle the foot and provide needed ankle support, but Merrell’s designed the upper-rear of the shoes so that the Achilles-tendon moves freely, without friction, when the toe-patch is on the ground, and the heel is vertical to the ground in the cycle of a runner’s gate. This design element is only found of some of the highest-quality long-distance running shoes, and it distinguishes the Pivot Lace (from a mere hiking shoe) as a serious trail-running shoe. Further, this notion of comfort and stability is reinforced with Merrell’s amply padded gusset tongue, compression molded in-board EVA foot frame and injection molded arch shank. These structural features working with the 4.5mm Ortholite Anatomical Footbed, Merrell Air Cushion technology, and 4.5mm lug-sole depth add up to quite a shock absorbing system. That’s 9mm of shock absorber. Get out your metric ruler and click off nine-millimeters to see for yourself how much sponge is built-in to the Pivot Lace to soak up trail shock. Rugged, rocky, trails are doable with Pivot Lace. Traction from the Vibram Axis outsoles are confidence inspiring. The terrain these shoes were evaluated on ranged from super rocky, loose, high-desert soil to muddy trail and pre-snow rain and sleet conditions. Tread design and traction performance where never in question as the Vibram sole compound is softer, and therefore sticky. Lug design offered great grip when conditions required the runner to slow down and scramble through rocky, boulder strewn trail obstacles. And the sole lugs have enough void area between lugs so small stones don’t get wedged between cleats. These well-placed lug-voids facilitate running by providing traction when needed, and the ability to glide over surfaces without catching or loading up with debris. Now, by the time this pair of Merrell Pivot Lace shoes landed on the doorstep, rain, snow, and mud were part and parcel to any high-desert terrain we frequent. The Pivot Lace is waterproof. 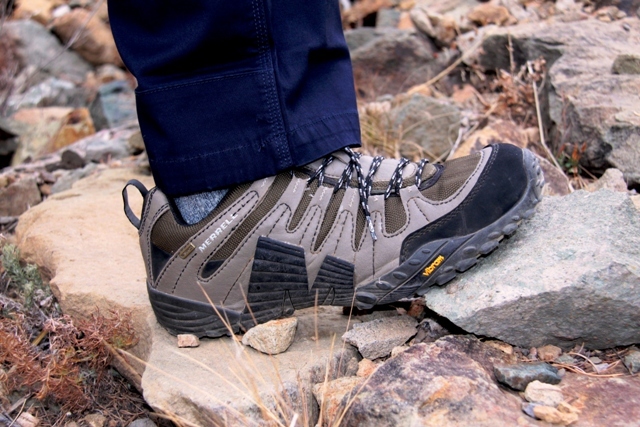 However, it’s not clear whether GORE-TEX is the technology used to provide the waterproof/breathable capability that was used in the previous Merrell Outbound Mid backpacking boots we reviewed previously on FreshAirJunkie. That said, if you step in a mud puddle or stream crossing over your ankle, you’re bound to get soaked. Short of that happening, the Pivot Lace is a great trail running shoe you can run in miserable, wet, conditions and expect to keep your feet dry. Light snow cover or plowed roads with packed snow are fair game. Rocky muddy is fair game. And even if you run on paved bike trails (like the very cool bike path that runs the length of the Huntington Beach, California shoreline), which often come with rutted and uneven surfaces, the Pivot Lace is a good choice. These trail shoes have the requisite all-terrain stability, comfort, and traction so important to keep your feet, ankles, and knees safe while walking or running at a swift pace. The achilles tendon rests in a collar that supports it and allows the foot a comfortable and full range of motion when at this vertical cycle of a stride. As for aesthetic appearance, the concrete colored pair we tested looked just fine whether worn on the street, with casual clothes, or on the trail. It might be better to wear dark colored socks with these runners as white socks might clash with the darker synthetic leather and mesh uppers; possibly making you look like a twitter-geek with no sense of style or panache. The design of the shoe lace eyelets combined with the foot-encasing synthetic leather ribs actually works well and looks appropriate. Having had the opportunity to experience products treated with Aegis Antimicrobial technology such as the case with these Merrell Pivot Lace shoes, we know it works. What Aegis Antimicrobial fabric treatment does is combat body odor. In this case, the Aegis Antimicrobial treatment fights foot odor. And this can only be considered good news. One of the biggest tests for proving the effectiveness of Aegis technology was to be able to include the antimicrobial treatment in white apparel. We got a white training shirt, much like a Body Armor shirt design, to test and determine how long it could be worn before having to wash it. Well, it was worn for an entire week in several hour-long, full aerobic and anaerobic sessions of calorie killing, physical exercise. By the end of that week, the shirt was washed for no other reason than it seemed like a breach of human dignity not to wash it. It didn’t stink at all, but it seemed pathetic to keep wearing as if this odor killing treatment wouldn’t someday catch up and bloom all at once like a red tide. Aegis treated fabric in any piece of outdoor or general purpose apparel or footwear is a good feature to look for. This we can attest to. Merrell footwear has a solid track record of making high-quality boots and shoes, and it’s been that way for decades. The Merrell Pivot Lace was expected to do well as a trail running shoe, and that’s why we asked to review a pair. So we are not going to hoot and holler about how great these shoes are. There were no down-side surprises, no dislikes. But when you pay good money for a product you trust is going to do what you expect it to do, there should be no surprises, only performance. And the Merrell Pivot Lace is, not surprisingly, designed to deliver performance. It does that very well. • Men’s Weight: 1 lb. 14 ozs. Good review, though I think these are designed more as a multisports shoe rather than solely a trail running shoe. Got a pair of these in the post, can’t wait to give them a try. 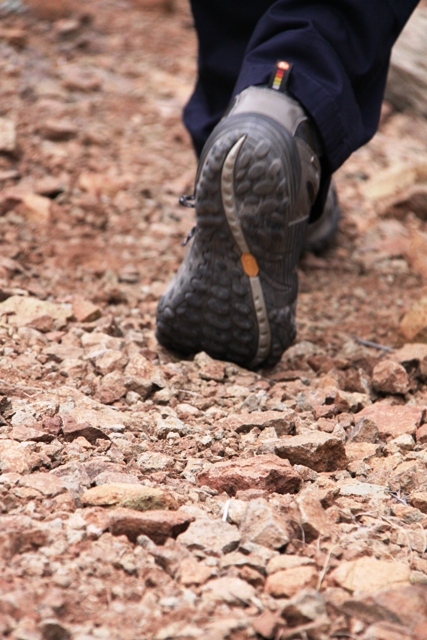 Hi there I have been wearing merrells for a few years now and love them. When I came across the pivot lace I fell in love. This is by far the best shoe I have ever owned it’s good for everything from hiking to laying around the house. If you are looking for a shoe that can do it all go with the pivot lace.